Showing results for tags 'turtles'. Who else here loves reptiles? Just comment your thoughts and what not about all kinds of reptiles! My favorite reptile has to be Bearded Dragons. It's ironic though since I do not have any yet! Nonetheless, I know just about everything there is to know about them. I like regular ones, leatherbacks, and silkbacks all the same. Though, silkbacks are a bit more difficult to care from what I hear, and more expensive. I plan to get two Beardies and have them placed in a 75 gallon tank by this summer. It would be cool to have hypos, trans, or even trans-hypos but I'd rather save the money and get regulars. As for colors, I want to go with either reds, oranges, yellows, or the standard tan color that most regulars are. I would include darker colored ones but I haven't seen them in stores like PetSmart or PetCo. Enough about me talking about Bearded Dragons, what kinds of reptiles do you guys like? Loosely based on the 1992 Classic game I used to play on my SNES (that's famicom to you dudes in the USA). Musketeer Leornado Wild West Raph Apoc Mikey Deep Space Don Interesting factoid for you Turtle Fans out there in the early 90's the term "Ninja" was considered to violent for kids. This meant the Turtles were rebranded as "Hero" here in the UK. even the credits were edited to be TMHT. This is the Turtles submarine I made for my son. It is based on the Nickelodeon cartoon series (season 1 ep 21: "Karai's Vendetta"). I made the LDD design a while ago but I had troubles finding the right parts, so finally here is the real build. (the LDD file can be downloaded from the Lego Digital Designer gallery) Let me know what you think of it. 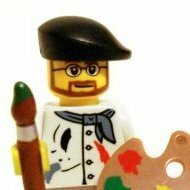 Dimi Ps: I have just read that LEGO will also launch a Turtles sub next Summer? I am curious to see it. After having recreated several TMNT 80s toys in LEGO, I wanted to try and take the colorful and a bit wacky style of those toys and make up my own design. So here is Leos Slimobile! Its primary weapon is the orange canon that fires slime. But there are also other weapons, such as the yellow cannons. And Leonardo's katanas of course! Comments are welcomed! Cowabunga! Hi everyone, I've just rebuilt this moc so I decided to update whole topic. Take a tour and enjoy : ) http://www.flickr.com/photos/90007636@N08/ alright here's a global view as you can see batcave is now a main feature but move first to the street: easy custom man bat, made from CM parts and another view now the turtle lair: and here's the main show - the batcave I wanted to add some guns to armory in type of this one from batman rises a little workshop bat's landing platform batboat's bay batpod and tumbler some barells with wine I couldn't take better picture of the trophy room : / I can only tell that there's giant coin, dinosaur and giand joker card Bruce Wayne, Alfred (yeah I know, the hair... : D ) and the main computer some armors for decoration training room one of outfits and here are vehicles seperatly alright, that's all, thanks for watching!!!! Parted out the new T.M.N.T sets today! TMNT: Attack of the Komakrang! At last! A build! I've been meaning to do a few things during March, and was finally able to get around to them today. These things are: 1. Entering the FBTB Contest 2. Building a Tachikoma 3. Using Olive green I'm really happy I got to do all these things, even if they were extremely rushed since I only built them in a few hours. Enjoy! I repost this since it was lost from the server move. So here is the Turtle Party Wagon from 1988 again. Unfortuantely no Turtles minifigs, yet (I have to wait till 2013 :)) Comparision with the real Turtle Party Wagon.